Blackberry Bold 9900 and Blackberry Torch 9810 customers on T-Mobile can let out a collective “it’s about time” as T-Mobile releases two new software updates. Both updates introduce a host of new features, few of which are more important or desirable than Wi-Fi calling. Notably absent from the introduction of both devices last year, unofficial word had us hoping to see the software update come as early as last November. Well, some five months later it’s out and ready for download and that’s really all that matters. So what else is improved? 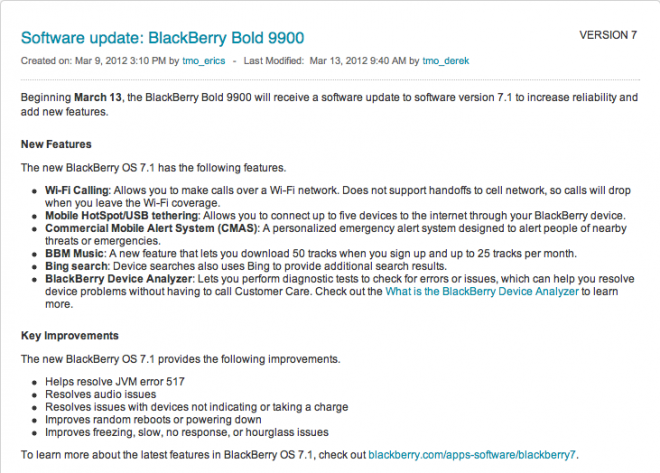 The new BlackBerry OS 7.1 has the following features. Bing search: Device searches also use Bing to provide additional search results. 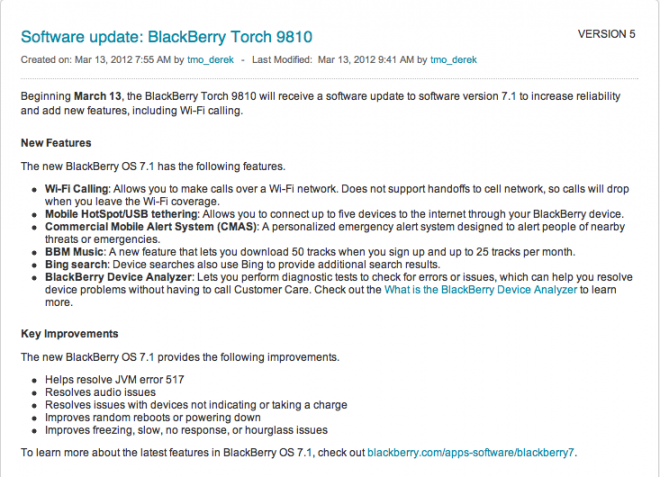 The new BlackBerry OS 7.1 provides the following improvements. I can’t believe this got released. I beta-tested .284 on my 9810 and it has a huge memory leak and WiFi Calling is flaky. .284 works fine on my Bold. So, they went from a rock-solid UMA solution to a software-based WiFi solution. Did they not realize that the last saving grace for the Blackberry was UMA? As long as I’m using Wifi at home or work, Wifi calling works great on my Android phone. Funny that it’s not working well on Blackberry. But I liked UMA a lot when I was using Blackberry phones. stick a fork in rim, blackberry is juice. and have a 40 oz Mickeys malt liquor along with those flamin hot Cheetos, they’ll go down a lot easier than with that purple pop you’ve been drinking. Too bad the software version of WiFi calling, can’t hand off to cell towers. That was the best thing about UMA. Yea does matter how good BB10 is the USA market left BB months ago.